Imagine if a group of your customers invited you to a party they were having to talk about your product? Would you attend? Of course you would. Or you would be stupid not to. So when those ‘parties’ are happening online every day it’s interesting how many companies don’t rsvp. 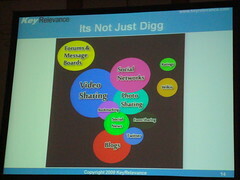 Li reminds the audience, that there are multiple tools to help you engage in Social Media. It’s not just Digg or Facebook or Twitter. But before thinking about the tools, think about your overall approach. Next, is Beth Harte, of Harte Marketing & Communications. She starts by explaining that attention to social media by the PR industry is lacking. Specifically, the industry tends to still focus only on media, dodging crisis and ignoring customers. It’s no longer just about the journalist. There are many conversations on blogs, forums, social media and PR needs to move toward putting the customer first. The next step for the PR Person is to connect the dots between offline and online to reach customers in a more effective way. Rob Key, of Converseon, is here to represent the agency side of Social Media. The marketing funnel has gone from a very linear approach to a Dr. Seuss type of funnel which includes conversations in multiple destinations and specifically destinations that aren’t always controlled by the brand. While social media may not be hard to execute, culturally it can be very difficult. Since social media transcends marketing disciplines, it makes it even more difficult. Free tools like Google Alerts can get you started. Conversation monitoring is documenting conversations. Conversation mining is taking the information, creating insights based on sentiment and letting that information drive what you do next. Social media is an engine of organization transformation. Within client organizations, help them decide who ‘owns’ social media to make sure you have an internal champion and educator. Understand the cultural nuances of the different communities and educate the client on what is appropriate in what channel. Work with your client to create a code of ethics and guidelines in an effort to increase confidence and cut down on the review process. 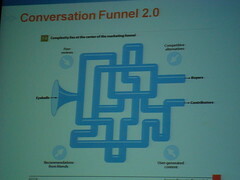 Identify what conversation assets you have and what ones you need. How will you make this happen and within what timeframe? Every social network is not right for every brand. Select based on where your target market is. Participate and learn. Identify the elders and come bearing something of value. Measure changes in conversation, increase in positive sentiment, share of conversation. Then identify what a 10% increase in sentiment means to the overall business. There are many ways to dive into social media, doing so with a plan is the first step to being successful and providing something of value. I appreciate the notes. Not all of us are able to attend these meetings. It’s so funny how much social media after hearing something you have the, “DUH” response. I love the Dr. Seuss funnel. Great article. Great post! Spot on about the whole approach. Companies here in Holland are quite oblivious to social media but it’s coming! I and others with me are working on it and articles like these are good examples of how companies should approach social media. Awesome. Favorite part of the post was the list of 1-7, in fact I used 5 or 6 of those principles this week to make sure my company was using social media the right way. This post just simply offered tremendous value in how to approach Social Media. Thanks again for a great breakdown. I look forward to reading more! I’m in a complete agreement with the observation that attention to social media by the PR industry is lacking. The moment the PR industry realizes that there is a world of PR beyond the journalist and the newspaper would be the day when the customer truly rewards the companies with increased attention and engagement. Hope it comes soon. Great post. It is this question of “approach” that seems so vital. Otherwise you can just wade in to social media and “drown” (or at least spend a huge amount of time with nothing to show for it).